By Sven Weum M.D. Ph.D. Illustrated magazines often write about healing miracles mediated by psychic healers, and many claim they have got their gift from God. But which god do the psychic healers serve? Do they have the gifts of the Spirit that are described in the Bible? In the introduction to Handbook of Healing we can read: "The word healing means curing by the means of energy and consciousness" (1). Psychic healing is used as therapy of all kinds of diseases, but the healers themselves often emphasize the spiritual side of healing more than its power to cure disease. Alec Forbes writes that "healing is not therapy, it restores the harmony between the soul and the cosmic laws" (2). The theory of psychic healing is based on the idea of spiritual energy, an impersonal power that permeates everything. Forbes writes that our existence consists of limits that need to be crossed, we all have our origin from "the energy of which we live and move and have our being" (2). He believes it spirituality, but there is no room to believe in objective truth, for instance in the Bible. Forbes writes that those who can only accept one teaching of faith are neither particularly filled with insight, nor with love (2). Psychic healers often claim they have a gift from God. Inglis and West write about the famous English healer Harry Edwards: "He made the point that all kinds of spiritual healing are the same, that means it comes from God. Healers obey the commandments of Jesus, which come from God, to heal the sick. Healers do not have healing power in themselves, they are human instruments to fulfill the divine plan guided by the agents of God, who are angels and dead spirits - who are appointed to complete his orders" (3). The aura and energy system are central ideas of psychic healing. Jorgensen & Ovesen write: "Man is more than the physical body. The aura is outside your body." And "it is first and foremost in the East that the human energy system has been profoundly explored. In the West this issue has been left to alchemists, theosophists and members of esoteric movements". They write that the human aura has five layers, which are also called bodies, levels, or dimensions. "These layers describe the human being in its entirety: The physical, the ethereal, the astral, the mental and the spiritual" (1). Inglis and West write: "Most psychic healers enter a condition of trance, this will not always be noticed by spectators or even patients. The healer's goal is to get in touch with his spirit guides - what spiritists compare to the Biblical guardian angel" (3). Alec Forbes says it this way: "It is not the healer who heals, the spirit does" (2). Jorgensen and Ovesen write: "The healer that works is not in his own self. He is conscious (when he does not work in trance), but at the same time in a meditative condition in which he is not bound by the limits of his personal self. The healer is in contact with his higher consciousness, his spirituality or his spirit helpers" (1). They also write that "the healer often take advantage of spirit helpers, that means non-physical beings like angels, spirits, gods, dead persons or helper animals" (1). It is not made a secret that spirits work through psychic healers. Inglis and West write: "The guide may actually possess them and take over while the healer is in trance, so that he may not be able to remember anything when he regains consciousness. 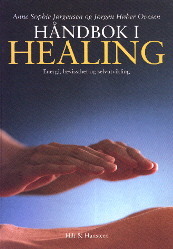 Jorgensen & Ovesen write: "There is no generally recognized explanation of the effect of healing. But that does not mean that it is inexplicable." They also write "To understand what healing is all about, we must accept the energy nature of man" and "in reality healing is an aspect of the spiritual energy" (1). By other words, healing can never be effective without spiritual power. If we believe in the Bible, we should not be surprised to recognize that non-Christian psychic healers can perform apparent healing miracles. The Bible describes several cases of supernatural manifestations that were not by the Spirit of God. When the apostle Philip arrived Samaria, Simon the sorcerer "astonished the people" with his witchcraft. People even said that "this man is the great power of God" (Acts 8.5-10). But when Philip preached the gospel and healed the sick by the power of God, Simon repented and was baptized. When Simon met the real power of God, he "was amazed, seeing the miracles and signs which were done" (verse 13). Today there are many like Simon. Every supernatural manifestation is not by the Spirit of God. But when the real power of God is revealed through the gifts of the Spirit, this will give glory to Jesus Christ and confirm the message of the Bible. The apostle John wrote: "Beloved, do not believe every spirit, but test the spirits, whether they are of God; because many false prophets have gone out into the world. By this you know the Spirit of God. Every spirit that confesses that Jesus Christ has come in the flesh is of God. But every spirit that does not confess that Jesus Christ has come in the flesh is not of God. And this is the spirit of the Antichrist, which you have heard was coming, and is now already in the world" (1 John 4.1-3). 1. Jørgensen, Anne Sophie og Ovesen, Jørgen Høher. Håndbok i healing. Hilt og Hansteen A/S. Oslo 1992. 2. Hill, Ann. Alternativ legekunst. En samlet oversikt. Dreyers forlag A/S. Oslo 1981. 3. Inglis, Brian og West, Ruth. Naturmedisin. Hjemmets bokforlag A/S. Oslo 1985. All Scripture references are from the New King James Version, ©1979, 1980, 1982 by Thomas Nelson, Inc.